Like a lot of cartoonists, I’ve gradually embraced the digital revolution in varying degrees. Being the lazy bum I am, I’m always interested in making my work easier. However, I’ve also always made a point to only adopt methods that don’t detract from the overall quality of the work, or call attention to itself by clearly looking like it was done on a computer. The best examples are my transition to using Photoshop to emulate classic halftone screens, and CorelDraw for my lettering and balloons (which I blogged about here). Again, the priority for me was to ensure that readers didn’t notice any change in the work, and to add other effects gradually and subtly. At the 2007 San Diego Comic-Con, a well-known industry pro who has been an acquaintance for many years turned me on to Google SketchUp, a 3D modeling program available as a free download. Only recently, however, did I begin to take baby steps with it, and I must admit I can anticipate it becoming a more regular part of my artist's toolbox. The program allows users to build and edit 3D models that can then be rotated and viewed at any angle. The model can then be combined with other models, and saved, downloaded and printed in a variety of usable formats. (There are also plenty of filters and features to turn it into a wireframe drawing, or to make it look as photorealistic as possible.) Even better, thanks to the generosity of the online community, there already exists an extensive database archive of objects available for download and customization. As any artist who has struggled with getting the angle just right of a gun, a chair, a staircase, an automobile, an airplane, or even a building or cityscape knows, the applications of such a program is mind-boggling. I’ve never used a 3D program before, so have no point of comparison for it. But the program is fairly intuitive, though of course once you begin getting more ambitious, you’ll no doubt need to delve into the manual. I first used the program for a shot of an airplane in an upcoming story. I found a generic plane in SketchUp's online library, rotated it to the right angle, saved it as a TIFF, then used a lightboard to bring it into the finished art. My next project was a bit more ambitious. 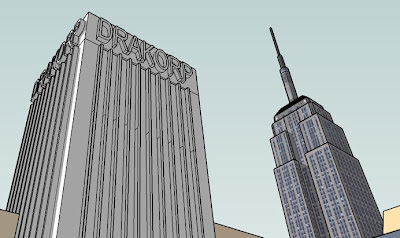 A fictitious building in New York City, the Drakorp Building, which is the headquarters for the title character of my comic-book series, Rob Hanes Adventures, occasionally appears in the book. Initially, I had found a generic skyscraper model in SketchUp's library. 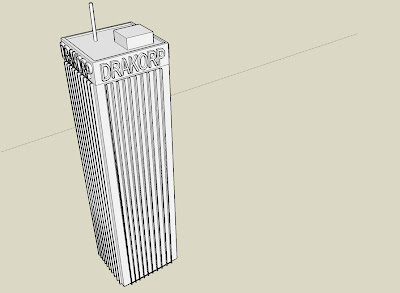 However, given the distinctive look of the Drakorp building, I thought it might be worth it to take the time to build a 3D model of the building that I could then always have on file to use whenever I needed it. Though it required some fiddling and more learning about the program, I actually built the model from scratch in just a few hours. You can see the model in its entirety in the image at the top of this post. It's actually a fairly simple, straightforward model, especially since each side is identical. The only part that turned out to be a challenge was cutting and pasting each side of the building with the window slat features down the structure's full length intact. Cutting and pasting in a 3D space turned out initially to be a bit tricky to figure out, but I finally got it to work. One thing I know for sure is that the next time I need to integrate a stairwell into a story, I will be using SketchUp! for anyone who may be interested. Happy Modeling!